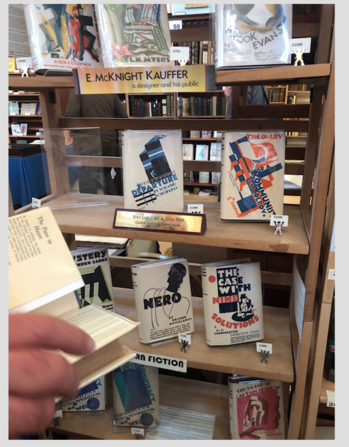 The highly collectible books of the beloved 20th-century British publisher Victor Gollancz are best and easily spotted by their distinctive bright yellow jackets and unusual use of fonts, which saved him the cost of commissioning cover art, but I learned recently at the ABA’s Chelsea Book Fair that for a short while before Gollancz introduced the yellow jackets, he commissioned 18 pictorial jackets from E. McKnight Kauffer in 1928, many of which were on sale at Chelsea from BAS Ltd, run by Ali & Giles Bird. The jackets are incredibly scarce, distinctive, and highly stylized and reminiscent of Russian contructivism. 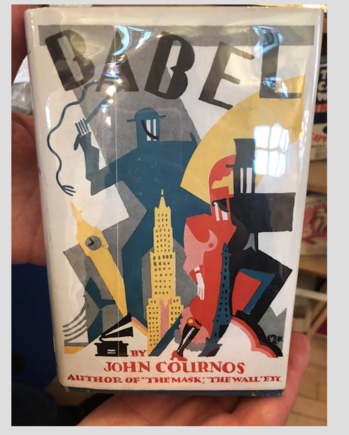 BAS Ltd. acquired the covers and have made good marriages, tracking down exceptional copies of the first edition books, including a Robert Frost association copy of John Cournos’ Babel. The highly collectible books of the beloved 20th-century British publisher Victor Gollancz are best and easily spotted by their distinctive bright yellow jackets and unusual use of fonts, which saved him the cost of commissioning cover art, but I learned recently at the ABA's Chelsea Book Fair that for a short while before Gollancz introduced the yellow jackets, he commissioned 18 pictorial jackets from E. McKnight Kauffer in 1928, many of which were on sale at Chelsea from BAS Ltd, run by Ali & Giles Bird. The jackets are incredibly scarce, distinctive, and highly stylized and reminiscent of Russian contructivism. 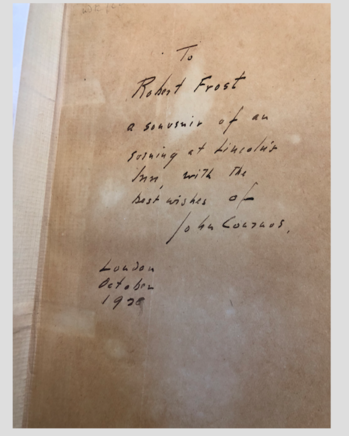 BAS Ltd. acquired the covers and have made good marriages, tracking down exceptional copies of the first edition books, including a Robert Frost association copy of John Cournos' Babel.